Farmers and gardeners spend much of the year in a constant battle to stop slugs and snails eating their vegetables. 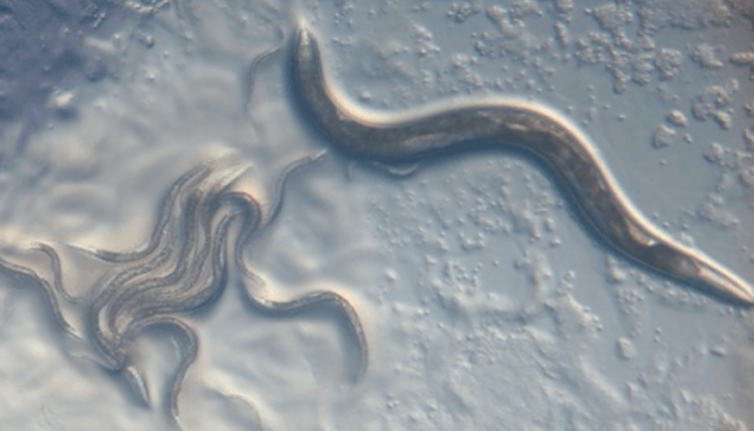 But these animals have been locked in their own co-evolutionary arms race for millions of years – a fight against parasites, specifically nematode worms. Now my latest research has shown that snails evolved to use their shells in this battle as a way to encapsulate and kill the parasites as part of their immune system. Terrestrial gastropods (slugs and snails) are one of the most diverse and abundant groups of animals on Earth, with between 65,000 and 80,000 species existing for 400m years. The success of snails is partly due to the evolution of the shell, a hard exoskeleton made of crystalline calcium carbonate. The shell has previously just been seen as a way to protect snails from extreme temperatures and from predators. Now we know it also offers defence against nematodes. These parasites are also incredibly numerous. We think there are around 100m nematode species but only 25,000 have been identified.Many are parasites of animals, plants and arthropod invertebrates, and 108 species are associated with snails and slugs. One species (Phasmarhabditis hermaphrodita) is so lethal to some slugs and snails it has been formulated into a biological control agent (Nemaslug) for farmers and gardeners to use instead of chemical pellets. These nematodes are applied to soil and hunt out the slugs and snails, penetrating and killing them between four and 21 days later. The slug and snail parasitic nematode Phasmarhabditis hermaphrodita. We knew that snails are generally quite resistant to P. hermaphrodita but slugs are highly susceptible. To investigate this further, I exposed some common snails (Cepaea nemoralis) to P. hermaphrodita for several weeks. When I dissected the snails at the end of the experiment, I found that the nematodes were trapped, fixed and killed in the shell. Over time, cells from the shell start adhering to the nematode cuticle, cover the entire body and then fix it to the inner layer of the shell. Often hundreds of nematodes are encapsulated at a time. This is not a specific response of snails to just P. hermaphrodita as other nematodes were shown to be encapsulated that do not kill snails. Nematodes trapped in the shell of C. nemoralis. This encapsulation ability doesn't just happen in the lab. Samples of wild C. nemoralis snails caught in Caithness in northern Scotland and Merseyside in north west England also had nematodes fixed in their shells. In some cases, 60% of the snails captured had nematodes trapped in their shells, with one containing as many as 101 parasites. Other snail species appear to have this ability too. By studying 1,321 shells from 43 genera (groups of species) from the Liverpool and Manchester museums, I found that nematode encapsulation is incredibly common. The evidence even suggests that this ability would have been present in the ancestor of most of today's slugs and snails, which lived between 90m and 120m years ago. 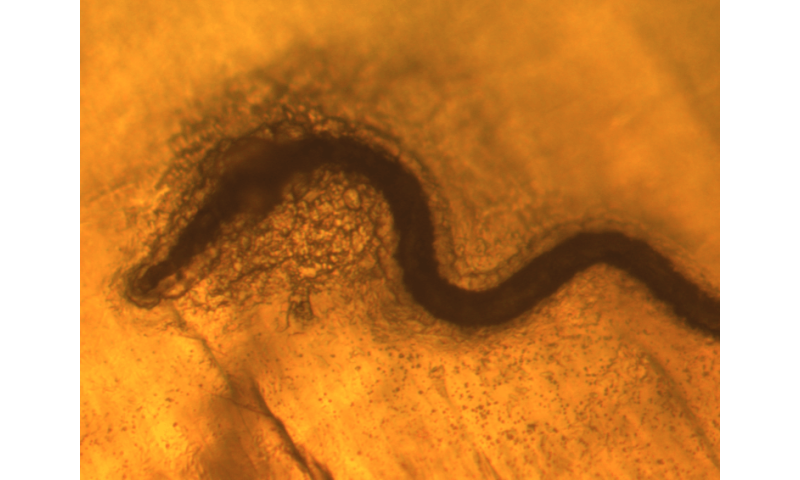 Single nematode fixed in the shell of C. nemoralis. By viewing these musuem collections, I also found that nematode encapsulation creates a permanent record of the parasites in the shell. C. nemoralis shells from 1909 and 1864 still had nematodes present, and even sub-fossil shells that were more than 500-years-old had nematodes encased. This raises the tantalising prospect of harvesting these shells for preserved nematode DNA and studying nematode evolution through time. Finally, I found that the reduced, internalised shell that slugs have under their skin can also encase and kill invading nematodes. So even though the slug shells play no role in protecting them from predators or environmental conditions, they have retained this important ability to trap, encase and kill nematodes. Ultimately, this research shows that exoskeletons, thought of as hard, rigid structures used as barriers, can evolve new roles. It is the first example of how an exoskeleton can be co-opted as an immune defense mechanism providing another level of protection against parasites. It also raises the interesting question of whether the shell originally evolved to kill nematodes. The earliest ancestor of molluscs (Odontogriphus), lived 550m years ago and also had a shell. It was small and could not provide protection against environmental extremes – and there were no predators at that time. 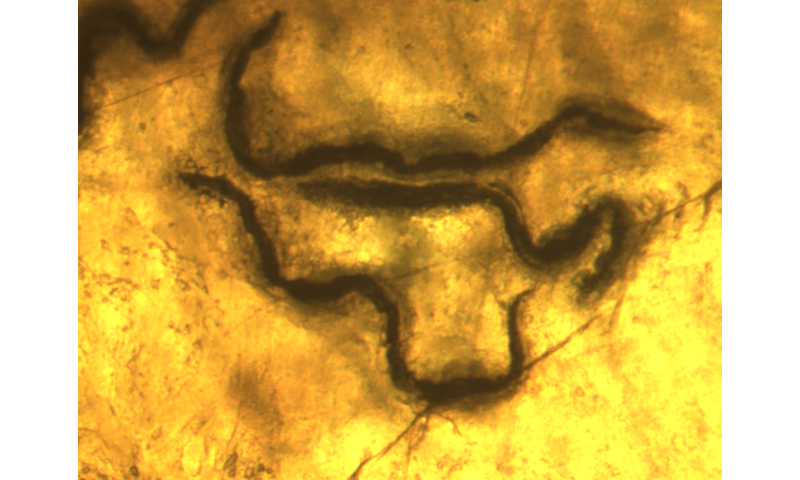 But there were nematodes at least 470m years ago. If these posed a threat to Odontogriphus, it may have influenced the evolution of the shell.